I Just Got Wise to "Comprise"
I have a confession to make. I’ve been doing it wrong all these years. “Is comprised of” — wrong. “Consists of” — right. But though I usually follow the advice of various writing and editing guides that recommend, because of the perils of comprise, avoiding the use of the word altogether, I occasionally resort to it in my own writing — not in the erroneous usage shown above, but on its own. However, as I discovered just today while working on a post about problem words, even then, I’ve been using it wrong all along. For some reason, somewhere along the line, I misread the dictum that when it comes to comprise, the whole comprises the parts. (“The federal government comprises the executive, the legislative, and the judicial branches.”) Instead, I’ve always constructed the sentence the wrong way. (“The executive, the legislative, and the judicial branches comprise the federal government.”) See for yourself. Search for comprise on this site. I’ll wait. I (along with other DailyWritingTips.com contributors) have routinely gotten it backward. How could I misunderstand that rule in all the grammar guides I’ve read? I readily admit that I have not yet mastered the English language. While editing and while writing alike, I have to look things up all the time — but I thought I had this one down. Now, you can be sure, I really do have it down (though I expect that I’ll start shaking uncontrollably every time I see . . . that word . . . and from here on out, because of this painful revelation, I’ll probably recast sentences with . . . that word . . . every time I see it—and, it should go without saying, refrain from using it myself. So, what’s the point of this post? For one thing, I want to acknowledge my error. 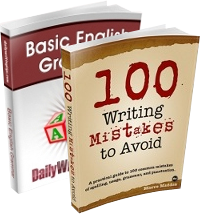 On this site, I both prescribe and describe many rules about English usage and grammar, and I almost invariably stand by my statements when a visitor, in a comment, challenges me (or when I admit that in a given case, perhaps we’re both right). But when I’m wrong, I have to say so. My main point is this: The English language is in flux. It always has been (at least since its inception), and it always will be (at least until its extinction). Just as languages evolve from one species to another — Anglo-Saxon becomes Middle English becomes Modern English — they are always, within themselves, in turmoil, and we suffer along with them. Merriam-Webster’s print and online dictionaries, in general, have a don’t-sweat-it approach when it comes to iffy usage, but my philosophy has always been to accept the dynamism of language without surrendering to usage that is both ephemeral and erroneous or that may someday be accepted but is still considered substandard in formal writing. Standards in language are like those in law: We have to be able to get along, and just as if each of us does whatever we want to in life, community shall cease, disregarding writing rules — as they stand at the time — will render us unable to communicate. So, when it comes to — all right, I’ll say it — comprise, the whole comprises the parts, not the other way around. Comprise is a one-way street. Wow, thanks for this. Like you I thought I’d been getting it right, but apparently I was getting it wrong too. How did you find out the error? I have been an editor for years and was called on this a few years ago by another editor when I was working on a team project. I felt a bit stupid and doubted my skills in general for a while. I am relieved to see that I am not the only one struggling with this concept. Thanks for being honest and for sharing with the rest of us! I’ve always found the evolution of the written language fascinating. Thanks for this post! I rather enjoyed it. Thank you. In business circles comprise is often misused because it sounds more important than compose–maddening. ‘The Elements of Style’ has a special place for these words. I find mistakes like this in my writing all the time. This is why I fear reading my old posts. No worries. Language is dynamic and better your learn now than never learn it at all. Good post, too. This is a common mistake. Mark: great post. This is one of the ones I used to look up every time I saw it in somebody’s writing. I thought my intuition had it right but never trusted it. Cliff: thanks for the mnemonic. That really works for me! 1. An apparatus COMPRISING X, Y and Z means an apparatus having at least X, Y, and Z. Something having X, Y, Z, and K is within the scope. 2. An apparatus CONSISTING OF X, Y and Z means an apparatus having X, Y, and Z, no more, no less. 3. An apparatus CONSISTING ESSENTIALLY OF X, Y and Z means an apparatus having X, Y and Z, but can only have additional matter, e.g., K, if K does not materially affect the basic and novel characteristic(s)” of the claimed invention. Interesting column. I am a patent attorney and when I write claims in a patent it is always in the form: A widget comprising: element a; element b. In patent law comprising is an open ended transitional phrase that allows other un-named elements to be included in the claim. For example in the widget above, if someone creates a widget with elements a, b, and c they would still infringe the claim. On the other hand, “consisting ” is a closed ended transitional phrase and a claim that is A widget consisting of: element a; element b will only be infringed by another widget having elements a and b. I am sure that this not that clear as patents are tortured pieces of writing at best. This is news to me. I do think this is one of those issues where the misuse is so widespread that unless you are a writer, editor, or resident grammar expert, correct usage would actually make you appear naive to the correct usage. I have to admit, I’ll be avoiding this one!! This sounds wrong to me. Can a language (or anything else) be in flux before its inception or after its extinction? I got it right – thank goodness (as an English teacher & copy-editor!) 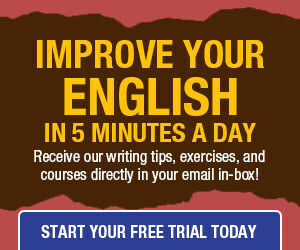 – I never thought of it the other way, but if you English experts could, so can many. Something to look out for especially with error correction. The sentence in question does not communicate the ideas you assign to it: “The English language is in flux. It always has been (at least since its inception), and it always will be (at least until its extinction).” That says exactly what I meant: The language has been in flux since it began and will continue to be so until it ends. Um. I can see Tim’s point; the sentence is arguably ambiguous. One way of reading “at least since its inception” is that there is an implied possibility of “more,” which would be “from before its inception.” You seem to have meant the phrase to mean pretty much the opposite–that “always” (which could refer to eternity) is limited in this instance to the period between the inception of the language and its extinction, but his reading isn’t inherently impossible, and might even be the more natural one. Larry. Thank you for your explanation. Thanks so much! I often make this edition (correctly) and my boss un-fixes it, right back to “is comprised of.” I’m glad to see that I have been interpreting it correctly. I also particularly appreciate your sentiment on prescriptive v. descriptive grammar, “to accept the dynamism of language without surrendering to usage that is both ephemeral and erroneous or that may someday be accepted but is still considered substandard in formal writing.” I’m always trying to write the “right” way, and I have trouble accepting the inevitable evolution of the language. Your approach seems like a healthy middle ground, and I plan to adopt it, if you don’t mind! I’ve been thinking about it: is it “wrong” to use “is comprised of” just because “comprise” doesn’t collocate with “of”? If we follow the rule that A is made up of B, C & D (ie, the whole comprises the parts), then why can’t we say “A is comprised of B, C and D”? And if it is “wrong”, is it prescriptively or also descriptively wrong? USAGE According to traditional usage, comprise means ‘consist of,’ as in : the country comprises twenty states, and should not be used to mean ‘constitute or make up (a whole),’ as in : this single breed comprises 50 percent of the Swiss cattle population. But confusion has arisen because of uses in the passive, which have been formed by analogy with words like compose: when comprise is used in the active (as in : the country comprises twenty states) it is, oddly, more or less synonymous with the passive use of the second sense (as in : the country is comprised of twenty states). Such passive uses of comprise are common and are fast becoming part of standard English. Anyway, this last post ‘comprises’ the humbleness of accepting an old mistake – and that’s not as common as we’ve seen the “error” around. If we accept the definition of comprise to be “to include,” then “is comprised of” (“is included of”) is wrong. Not all guidebooks agree, and the usage is becoming increasingly common, but most editors have agreed to hold the line. I accept that “comprise” means “be made up of”, but it is not exactly that. It’s just like how words or phrases have synonyms but don’t mean exactly the same thing. I am a volunteer copy-editor and I accept “is comprised of”. Maybe I’m just progressive. : ) Thanks, Mark, for the clarification. As an American I’ve always remembered this one with “the US comprises 50 states”. I resist the “common usage” argument for “is comprised of” because 1) it is wrong, and 2) there is already a word that means that– composed– and NO word that means what comprise does. So the preservation is useful as well as pre-existing. @Larry– I don’t know if you are a lawyer in the US, but as one who works with American law I can tell you that legal definitions are in no way the same as “English” definitions. I’m sure you know that, of course, but it is easy when using professional jargon and especially legalese to forget exactly how screwed up legal definitions, not to mention pronunciations, are be they mangled Latin, corrupted Norman, or just plain bad English. In regular English, your definition of consisting of is closest to what comprise actually means, “includes in total”. An apparatus COMPRISING X, Y and Z means an apparatus having X, Y, and Z, no more, no less. First of all – thanks, Mark, for the article. It brought up an interesting issue, which I never thought as existent, as I do not meet many native English speakers lately. However, I have a remark to make to venqax. While admitting that many of legal jargon is a poor usage indeed, I must insist that in case of “comprise” it is as accurate as it ever goes. Nobody argues that the whole comprises parts. One would never object to a statement that a certain whole comprises several parts, even if it comprises other parts that are not a part of certain discussion. Therefore, a statement that an apparatus comprises A, B and C, merely states that there are parts A, B and C present in the apparatus. Indeed, if you describe the whole apparatus, as consisting of A, B, C, D and E, you cannot really argue that the same apparatus comprises parts A, B and C, as it comprises them, alongside with unmentioned parts D and E.
I do not really remember the court case that looked into the same matter, I will look it up and cite the decisions – they are much more expressive than I will ever get. Another point that you make regarding “closedness” of comprise is that “the US comprises 50 states”. And indeed it is so. However, have the United States always comprise 50 states? Will the US ever comprise only 50 states? Recall the anthem of the USA, last verse. the tildas mark my accents. The US comprises 50 states, and the list is open, as long as there will be enough land for free and brave men to make their homes under star-spangled banner. Do I read correctly the anthem? Do you? If you do, you will agree that “to comprise” means literally “to include without being limited to”. Dave: For regular English I would refer to the wiktionary’s definition, for 2 reasons. First, I think connotatively the word does imply comprehensiveness as said; and second, comprehensiveness is inherent in the word’s origin. As for the fifty states, obviously anything can change in time. Saying the US consists, in its entirety, of fifty states is accurate, too. That means it is the case, it doesn’t imply that it always was or always will be. Similarly, saying fifty states compose the US, or the US consists of fifty states, also implies comprehensiveness. You would not say, today, that the US consists of 14 states– leaving it that there are 36 others you aren’t mentioning for some reason. Have any of you bloviating dolts ever heard of a TRANSITIVE verb? I searched this post and its comments for the word “transitive” and found not a single instance. That tells me not a single one of you has a clue to what this is about. The instant you precede “comprise” with “is” or “are” and follow it with “of,” you’ve committed a grammatical sin, the seriousness of which in my newsroom would get you caned to death or burned at the stake, depending on how much coffee I’d had that morning. This is about usage, NOT definition. The definition of “comprise” is etched in etymological stone: It means “to contain,” as parts making up a whole — the whole “comprises” the parts. Consider the word “include,” a transitive verb identical to “comprise,” except it means “to contain or take in” only PARTS of a whole. Otherwise, grammatically it’s identical. But if you do, you’d better do it FAR from my newsroom, where “fluxing” English is harshly disallowed except in extremely odd and rare instances.